* Mariell's beautiful floral Wedding Earrings (3/4" w x 7/8" h) boast hand-set pave Cubic Zirconia & lustrous Soft Ivory Pearls. 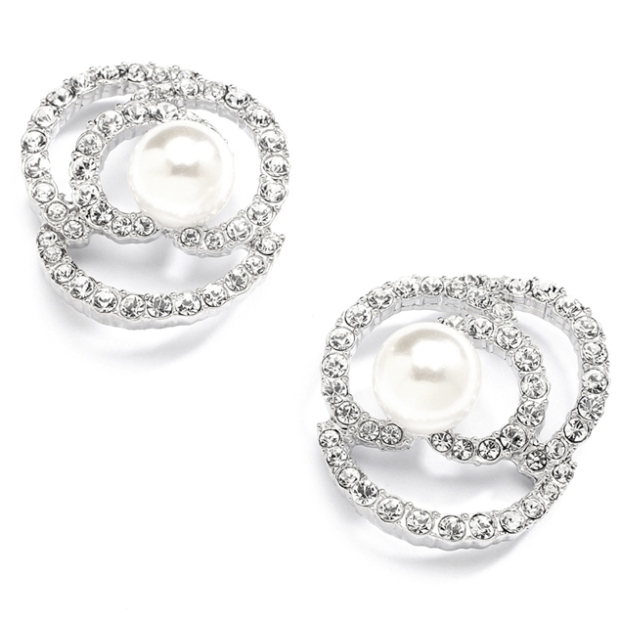 * Our couture bridal earrings are plated in high quality Genuine Silver Rhodium for the rich look of Platinum and cultured pearls. * Add these beautiful wholesale wedding earrings to your store's jewellery display to offer a one-of-a-kind designer bridal style to your customers. * Mariell's pave CZ pierced earrings are made with AAA grade Cubic Zirconia and match our gorgeous statement necklace style 4055N. * These lovely soft cream pearl earrings are a popular accessory choice for bridal retailers & stockists because of their versatile appeal to brides, mothers of the brides and guests at black tie affairs and galas.